Home > Travel guide > Lao Cai: Ready for Tourism Cultural Week "Colors of White Highlands"
Visitors able to explore the mountainous area of Bac Ha during June 1-9 festival. Bac Ha town in Bac Ha district, northern Lao Cai province, will host a Tourism Culture Week from June 1 to 9. The highlight of the week is the plum festival at Hoang A Tuong Palace from June 3 to 6, offering various types of farm produce at 20 booths, such as Tam Hoa plums, Nam Xit rice, Tuyet San organic tea, and honey and mushrooms from the districts of Bac Ha, Si Ma Cai, Muong Khuong, and Bao Yen, and Xin Man in the neighboring province of Ha Giang. The week will also feature a street festival on certain streets in Bac Ha town, a cycling tournament from Bac Ha to Xin Man, paragliding on Quan Than San Mountain - Co Co Lake in Si Ma Cai, and traditional horse racing. Other activities include presentations of traditional crafts, mountain cuisine, and folk games, visits to community-based tourism villages in the communes of Na Hoi, Giang Pho, Ta Chai, Ban Pho, and Bao Nhai, and discovering the well-known Bac Ha Market. 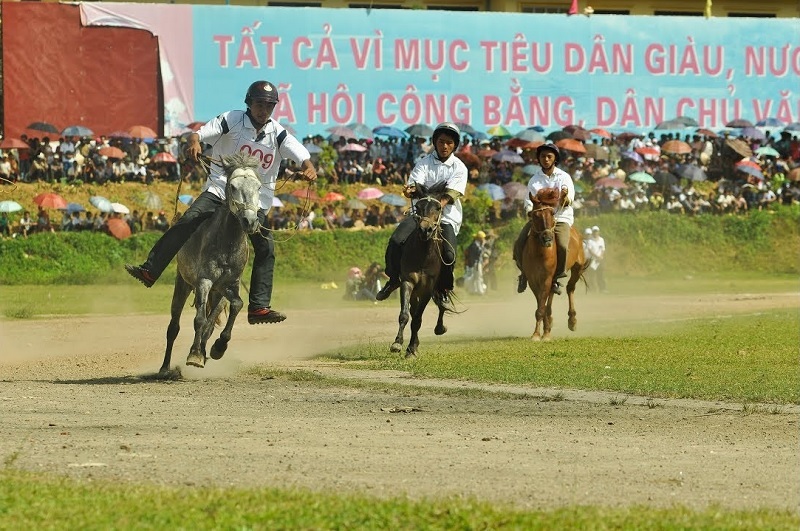 Co-organized by the Lao Cai Provincial People’s Committee, the Departments of Culture, Sports and Tourism, Agriculture and Rural Development, and Information and Communications, as well as the tourism association of Lao Cai province, the festival aims to introduce and promote tourism products, handicrafts, culinary culture, and other products from ethnic minority groups in Bac Ha and Lao Cai. It is also to contribute to encouraging the conservation and production of traditional handicrafts, foster participation of the ethnic minority communities in tourism development, and promote the image of Bac Ha among domestic and foreign visitors. With cool weather year-round, Bac Ha also boasts beautiful landscapes such as majestic mountains, beautiful caves, and terraced rice fields. It also has a rich culture, with 14 ethnic minority groups and historic sites such as Bac Ha Temple and Hoang A Tuong Palace. Bac Ha Market, the largest in the area, attracts H’Mong and other ethnic minority groups living in the area. H’Mong residents in Cat village, meanwhile, are particularly skilled at producing gold and silver jewelry. Located 300 km north of Hanoi, Lao Cai city can be reached by car or train. The province has preserved many of its cultural and historical sites, including stone engravings from thousands of years ago in Sapa’s Muong Hoa Valley and the Pho Rang vestige site. Lao Cai is especially proud of Sapa, a unique tourist site with good weather and beautiful scenery. Visitors in summer can perhaps experience the four seasons in one day. It welcomed some 3.5 million visitors in 2017, up 26.5 per cent against 2016.